With registration for spring semester classes currently on going — and me deciding whether or not to continue taking classes before my French refresher begins in August 2012 — this seemed a superb topic. While I received a great education at the University of Texas at Austin back in the 90’s, and came away with not one but two Bachelors degrees, the thing I regret the most is not living on campus while I went to school. When I graduated high school, Mom and Dad handed me a check and gave me a choice: you can buy a car or live on campus. By then I’d been working at Target for six months, with both of them playing chauffeur for me, which I’m sure was getting old for us all. And that dollar amount on the check didn’t really seem like it’d be enough to pay for campus housing (it certainly wouldn’t have covered it these days). So I opted for the car. Now, in some ways it was a good decision. That red 1977 Oldsmobile Cutlass Supreme I named Rhonda Christine gave me a lot of freedom and made me lots of friends; heck, I could take 9 of my closest buddies to the movies with me all in the same car! I could work more hours because I didn’t have to rely on the parents for transportation, which enabled me to get a promotion with earlier hours (and meant I was done by noon). As a result, I changed my school schedule so I was home a lot earlier in the day, and I could take classes that ended after the last bus picked up from campus. I was able to work enough hours to pay for school without needing a student loan, and these days that’s a huge debt to not have hanging over my head. Yet I have so many friends that have stories from their college days while living on campus, both good and bad of course, and many of those friendships are still in place today years later. They tell me of their many roommates and the parties, celebrations, girls nights in, girls nights out, campus activities they attended and so on. Now, I’ve had my own version of a “walk of shame” — there was one occasion when I had to sneak my boyfriend downstairs and out the front door in the wee hours of the morning after he’d climbed the fricking tree outside my window and knocked on my patio door, surprising and scaring the bejeezus out of me. But we didn’t get caught and that was a good thing, so it’s not quite the same. I do know that if I am lucky enough to have kids, or rope me a guy with kids of his own, I’d definitely want them to have the option of campus life (although I’d probably add in the caveat of a part-time job to cover their cell phone bill and spending money). In hindsight, I know I missed out on a very important part of the college experience by not staying in a dorm. Well, today was the day Mom and I were supposed to use my Groupon to the Austin Zoo as the first of her two days of birthday fun. We had a plan that started with breakfast at Jim’s, a tank of gas and a map. But the Fates had another idea. As we’re driving along on 290W and we still hadn’t reached the exit our directions provided (which should have appeared 5 miles earlier), we saw the sign that changed our plan on a whim. Now, for those of you who know me, I’m not really big on change. Of just about any kind. And yet, all of a sudden there we were, staying on the road and heading for a place we hadn’t been in years: Fredericksburg! Yes, I’ve been there before, but not with me at the wheel. It was fun, and Finn (who’s my car, for those of you who don’t know I name such things) absolutely loves road trips. Not to mention Mom and I had a ball. The day was filled with giggles and laughter and bad sing-alongs, and that was just on the way into town! Once we hit Fred’burg, we parked and ran for the restrooms (bottled water and all that laughter had made things interesting for that last half-hour) then headed down Main Street. Some things were new among our old favorites, and we stopped at quite a few. I love those old five-and-dime stores, and who doesn’t love warm strudel and smooth fudge? We tried on Halloween hats amid gales of laughter and gorgeous Venetian masks of all levels of elaborate design. The day ended at our favorite biergarten for a late lunch with bubbles blown into the breeze. We headed back home just the right amount of tired and still feeling silly. We had a Twizzler “sword fight” along the way (yes, one can shift one’s car while holding a red rope) and just about everything struck us funny. By the time we got home our sides ached and we didn’t even mind getting caught in the beginnings of rush hour traffic. Hi all. Just a quick note today to let you know I’ll be having my audition for my church’s holiday extravaganza this Sunday by doing a piece from “The Pirates of Penzance” — the Major-General’s Song. I will be attempting to sing it as close to the George Rose version as I can get it (from the 1983 movie) but perhaps not quite that fast as I enunciate regarding the square of the hypotenuse. :) Those breathing and speaking exercises I learned in theatre class are most definitely going to come in handy! Last year I sang a bit from Glee (“Hello I Love You”) and chickened out after 30 seconds. I think this time I can do better, and maybe even be in the show as more than just an ac-tor. I even have green cargo pants, a camo tank and a military style cap to dress the part of a modern Major-General too. Here’s hoping I break a leg (or at least finish the full audition this time)! 1) Central Park, New York City — when I visited there years ago, I could just see sitting on a blanket in the park with my laptop (and multiple spare batteries of course) writing like crazy among the trees, the buildings and the masses of people. So inspiring! 2) A cabin in the Montana mountains — yes, it’s kind of a cliche, but what’s not to like about a cabin on a lake with cool mornings, fresh air and being able to turn the music up loud? 3) A pub in Dublin — I just love the vibe of an Irish pub, especially in Dublin. The cadence and feel of it call to me, and yeah okay, being able to get a half-pint of Guinness whenever I want is a plus. For my favorite reading spots, see #1-#3 above, although curled up on my couch or bed with my cat beside me is hard to beat. Since most of these have in some way or another come into play regarding finishing my novel, it seemed apropos. 1) Watching my favorite television shows either recorded or on Blu-ray/DVD ~ 2) Reading books ~ 3) Working on craft projects, such as cross stitch, jewelry making or scrapbooking ~ 4) Doing absolutely nothing! ~ 5) Hanging out with my Mom going to movies or out for dinner ~ 6) Browsing discount bookstores and movie stores ~ 7) Going to the Alamo Drafthouse for a movie and a meal ~ 8) Working on other writing projects other than the one I should be ~ 9) Going to my day job ~ 10) Surfing the internet ~ 11) Attending classes at the community college ~ 12) Taking a much needed nap! For today’s post, I’m checking in from the TXRD playoffs and it’s halftime. I’m what they call a “derby virgin,” never having been before. Woo hoo :) it’s pretty wild, and loud and fast. 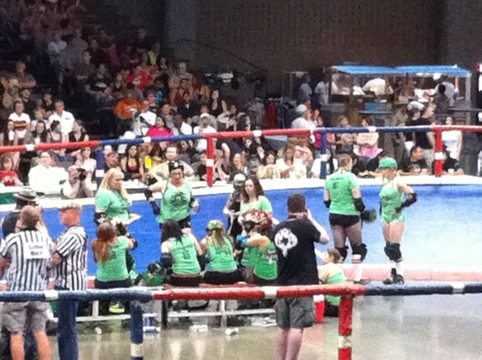 I’m rooting for the Cherry Bombs, as I know the super-fast “Kate or Dye,” the gal I’m interviewing for my Anthro paper. But las Putas del Fuego have a great defense and a couple secret weapons, so it’s any team’s game until the last minute I’m sure. Today’s September 30th, and you know what that means: it’s exactly 31 days before National Novel Writing Month (aka NaNoWriMo) begins again in November. The first year I attempted this challenge was in 2008, and I succeeded in writing every day from November 1 through November 30, even though I didn’t meet the daily word count or work on something new like the rules suggest. The next November was significantly less prosperous; I think I wrote nine days total that month. Last year? Well, I completely flaked out and didn’t even sign up because 2010 was pretty much a mess with the exception of my fantastic two-week trip to Ireland. This year, though, I’ve actually worked on writing-related projects, albeit not THE writing project that’s been dogging my heels for years. So, why am I bringing this up? It’s time for a pre-NaNoWriMo challenge! Even after having accomplished it once, the idea of writing 1,667 words a day sounds pretty daunting. (So far, there’s only 167 words in this post, so multiply that by 10 and there you go.) So on today’s News post, WordPress suggested joining the Post A Day 2011 challenge for October as good preparation for jumping right into NaNoWriMo. Sounded like a pretty good idea to me, especially since I already get the daily emails from Plinky to help keep me on track (see “Where’s Nikki?” below for more info on those guys). Since when I’m writing I usually follow it up with a post to muse on how it went (miserable, stupendous, ridiculous, appalling and so forth), this should be pretty easy. It’s just an added bonus that there’ll be that much more new stuff for you guys to read, and maybe I’ll get some new visitors to this page of mine as well. It all starts tomorrow, and I have a feeling I already know what it’s going to be about. Stay tuned!